Can you get cheaper insurance with more experience? I was exploring renters insurance on the AOPA insurance website and noticed that while you get a 10% discount for having no claims, there seems to be no difference in price between a private pilot with 50 hours and an ATP pilot with 5000. Why is it not the case that more experience yields cheaper insurance? Is this normal for aviation insurance? It's not at all clear that more total flight hours correlates to lower risk. 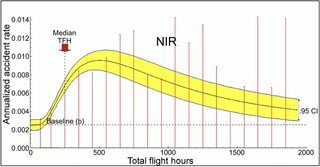 Data shows that pilots with <200 hours of total flight time are at the lowest risk of having a serious accident. One can speculate the reasons for this, but the truth is, aviation accidents are still very rare occurrences. This makes gathering and analyzing data difficult. The data is very noisy due to the low sampling rate. That said, statistical data points to a low rate of accidents until somewhere between 100 and 250 hours. 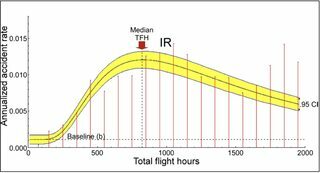 Then it increases steeply, reaching its highest point around 500 hours for non-instrument rated pilots, and 800 hours for IR. Statistics have long shown a "hump" in accident rates at the middle zone of experience. From there it descends slowly over time but never reaches the low rates of new pilots. Another thing that occurs is that the number of pilots at a particular level of experience decreases extremely rapidly after a few hundred hours. It decreases to the point where the number of pilots with high hours is very small. The sample rate is then so small that it's close to impossible to come up with an accurate risk assessment. Additionally, sometimes insurance rates are obviously driven by factors other than risk. Most aircraft insurance will give a discount for instrument rating. But if you look at the above graphs, IR pilots are at a higher risk than non-IR. They can fly in IMC, which is higher risk, but they have cheaper insurance. This is clearly a marketing decision. If one insurer gives you that discount where others don't it will attract more customers. I asked the insurance brokers point blank "what can I do to bring my rates down?" and in all cases they answer, "add time in type". An instrument rating would bring my cost down by about 10% across the board and subsequently increase my hours. If I had time in type (in aircraft model) that would bring my rates down about 10%ish as well. Adding time in the archer VFR only would not effect my rates for a different air frame like the Mooney. Most insurance companies will also stipulate some mandatory instruction time before you can carry passengers. If you actually apply for a quote as a 50 hour VFR pilot you will get a very different quote than a 5000 hour ATP. The base insurance on the air frames hull value may, however be consistent. Most applications also ask for total hours in the past year as well as total hours over all. i.e. they want to know how much you have flown recently which they put importance on. If you poke around some of the aviation forums you will find stories of huge insurance drops after a year of ownership and time in type as well as stories of hikes for no apparent reason. On the topic of gap insurance. Generally speaking you get gap insurance (renters insurance) to cover the deductible on the flight schools insurance. My FBO/Rental facility has a 10K deductible (their policy covers beyond that) the renters insurance covers me from 0-Deductible min as well as some passenger liability. The price (for the past few years) despite my increasing hours has held fairly constant which is a bit contradictory to the rate patterns for personally owned aircraft. Keep in mind this is not air frame limited and extends to any aircraft Im legally aloud to fly/rent. Not the answer you're looking for? Browse other questions tagged insurance renters-insurance or ask your own question. What are typical insurance premium reductions for renters and owners as they earn instrument and commercial tickets? How can a foreign pilot get renter's insurance in the USA? How can I deal with insurance requirements for flight hours and training in order to carry passengers?